Sometimes what matters to most peoples is how they look ,obvious right ? As you don't wanna look weird in front of others.. don't you ? Many a times are we trying things out ,well me as a boy, I also often try things out say with my hairs ,throwing up some gels making spikes and all hair styles... Trying new styles with my beard.. No offence just trying things out..!! Dont have any idea about the girls, but hey what if there was a better, a more efficient way ? Well technology is advancing wickedly and frankly speaking, there are no limits or Boundaries that we can't achieve.. Looking at those Quantom Dots technology TV's launched at CES 2015, Boy i gotta say it's Awesome ! 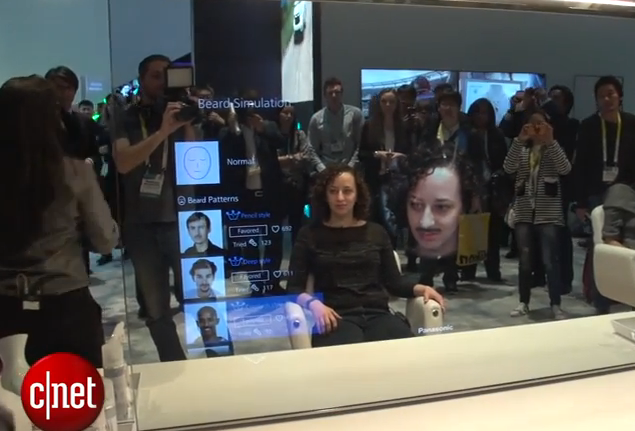 Panasonic showed an early prototype of its smart mirror at CES this week, Don't know why but looks like it was designed specifically for Womens. All of you Ladies you are going to love this ! So starting with the basics.. 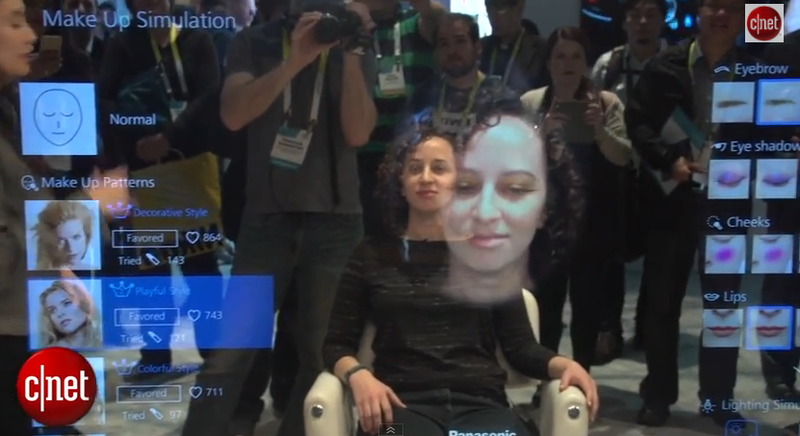 It is a pretty cool device & has several cameras built in ,which analyze our face and give us a 3D view of our face in realtime ! Basically now you can do, what you have never done before like animating yourself, adding realtime effects on yourself like you apply filters while editing a photo maybe on instagram.. , Want to look how you would look if you had wrinkles ? well go ahead try it out, this machine is a beast when it comes to digital makeup of yourself Ladies as well as Men!! For Girls : You can remove spots, wrinkles, lines & change eyebrows, eye shadows, make yourself look beautiful by changing cheek colours.. Hey its free ,well once you buy it ! Since you know it's virtual make-up no need of worries at all because, if you messed up don't worry just delete that & restart with new Digital makeup, unsual enough but you can even add moustache, beard ,add lipstick to your lips.. hence forth you try some thing at your home and if you like that save it and go to saloon apply it, crazy ain't it ? For Boys : You can try different hair styles, beard styles, adding skin tones, removing/adding moustache !! & Vice - versa.. Kids can also play with this around like for many hours take photos share it on social media!! Now the real fun starts.. Fun fact : This is like giving a child, a gaming console and forget that, he'll not trouble you for a while, Except now Husbands can try this out with their wifes just by showing their wife this device and basically enjoy Football game, no interruptions yeah ? Just a Joke !! Basically this is just a prototype device and there not an official word at which price it would sell or when it would be available. We would soon see it at salons and make-up stores.